Consultations are by appointment only during the times shown below. Appointments can be made in advance by telephone on 686960 or in person. Same day appointments are limited and are available by telephoning the Surgery on 686960 at 08.30am. All nurse appointments are pre-bookable together with a number of emergency slots which are bookable on the same day for minor illnesses etc. Please note, we operate a one person per appointment policy; should you require more than one member of the family to be seen, please indicate this when you call. Urgent cases are given priority and will be seen the same day. All persons under 16 years of age must be accompanied by a responsible adult. If you cannot keep your appointment, please let us know as soon as possible so that it can be allocated to someone else. 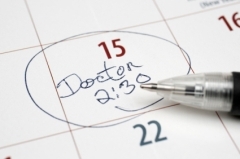 Attending late for an appointment may result in you being asked to make another appointment or having to wait until the end of the clinic to be seen; to maximise clinician time, all patients are advised to attend for the appointment in good time. Our nurses run clinics by appointment only. You may be asked by the Receptionist why you wish to see the Nurse – this is to assist us in the appointment time planning to ensure we have adequate time set aside for you as some procedures and medicals take longer than the standard 10 minute slot. Please assist us by giving us as much information as you can regarding your requirements. It has been agreed that any resident of the United Kingdom will be able to receive treatment by a GP on the Isle of Man on the National Health Service as a Temporary Resident providing we have an available appointment, or if none available, patients will be advised that they can be seen by any GP on the Island. This care should only be for immediate and necessary treatment. Any persons not having a permanent Isle of Man or UK address will incur a fee. These fees are irrespective of whether the treatment is on an immediate and necessary basis or not. An additional fee will be charged at the Pharmacy for any prescriptions required (private prescriptions incur a dispensing fee and the cost of the drugs), or at the Hospital if blood tests are required. We do NOT accept credit/debit cards so payment can only be made in cash or by cheque with a guarantee card.